ReactJS is one of the trending and most happening UI frameworks. Developers love ReactJS, and It’s being appreciated and well received from the developer community. With no further delay, let’s jump into the details and understand about ReactJS in a detailed manner. Should be familiar with programming concepts like Objects, Classes, Functions, Arrays, etc. JSX stands for Java Script eXtension, which is recommended in React development. There is no hard and fast rule that says JSX has to be used in implementation though. React applications are all built up using components. There is a definite thought process that has to go in, into React development as the code should be very much maintainable when you get into larger scale projects. Flux is a design pattern that enforces keeping your data unidirectional. By this pattern, React suggests to keep unidirectional data flow which further makes it very easy to understand your application. 1. Usage of virtual DOM as against regular DOM makes it quicker, since virtual DOM is a lot quicker over the regular DOM. 2. React only covers View and Model layers of an application, hence making it dependent on some framework or the other to complete the tooling set for development. Get ahead in your career by learning React JS through Mindmajix React JS Training. 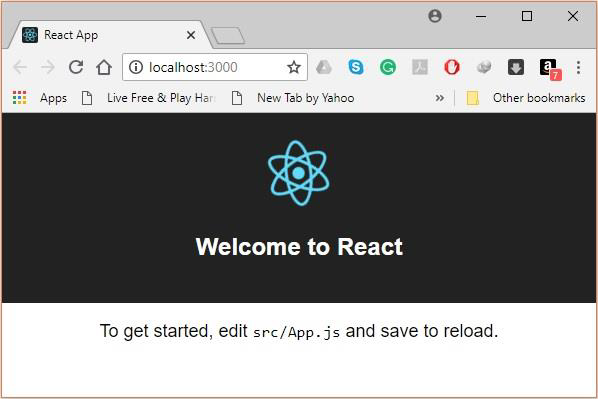 This section of the article discusses about the steps that are required to set-up your environment for React development. You might feel that there are so many steps for this to get started but believe me, this will help you achieve faster development very soon. Webpack is a module bundler which helps managing and loading dependent modules, and compiles them into a single file or bundle. This bundle can be used during your application development using either by the command line interface or by configuring in webpack.config file. With the dependencies for the installation process handled and understood, let us get down to business of (React JS) installation altogether. Create a folder naming ReactJS Application on the desktop to install the required softwaresand dependencies. All of this will be done using the command line way. Module creation is controlled by the package.json file, and now that we have created the required folder, let us run the npm init commands to create the package.json file. This will ask for more details further, which can skipped by padding a -y parameter to the previous command. Since we need to install ReactJS, we need to install its dom packages using the install react and react-dom npm commands. The packages that we are installing now can be saved to the package.json file by adding the --save option in the commands above. After the react and react-dom modules are installed, it is time to install the webpack modules, which can be done in either ways. The installation here requires to install all the three Webpack modules namely webpack, webpack-dev-server and webpack-cli. After the installation of webpack modules, we need to install all the 5 babel dependencies namely babel-loader, babel-core, babel-preset-dev, html-webpack-plugin and babel-preset-react. Identify the difference below, as we are going to save these dependencies as only development required dependencies. Once the above change is done, open package.json in Notepad++ or Visual Code and delete the test, echo, and exit 1 entries under the scripts object. This is not required as we wouldn’t be doing any testing in this section after this installation, but add start and build commands instead. We would then require to import this React component and then render this in our root App element, just so that we can watch it on our browser. This change is required in main.js file. A simple thing that one should remember is that whichever component that you as a user want to work with, import it and when you want to use one of the created components - you would want to export and import in the file where you want and then use. For such a thing to happen, the following entry should go and sit in the .babelrc file that we created sometime back. index.html is a regular HTML file. Here, we are adding the following code div id = “app” to mark it as the root element and also we will be adding index_bundle.js script, to mark that is our bundled application. App.js is our first React component which will render a simple Hello, World message on successfully starting the React server. Once the command above is executed, it would create a bunch of source files with some default implementation. These auto generated files can be deleted in this step and the next step we will add our own custom implementation to test this setup process. In the examples above, we have just used simple HTML code additional to what can be achieved with a single “Hello, World!” React JS program. There are further constructs that could be used to do arithmetic operations, ternary operations, styling, and add some comments to your React programs. These can be achieved by using just the same sample program and replace the ordinary HTML code with an aforementioned construct from React. As we have already discussed earlier, any of the React code that you would want to write would have to go under a component. With this understanding, let us learn how to combine components in order to make the application well maintained. This approach will allow changing your component without even affecting the rest of the page. On running the above code, this is what the browser would be displaying. On running this program, we would now be able to see that, instead of a stateless Content tag, we are now able to display dynamically added data with some state details attached to it. We can refer to the examples discussed in the previous section to understand more about State in the React JS world and also how it can be used. The only difference that one can identify between a State and Props is that Props are actually immutable objects. This is main reason why Container component always has a state defined, which gets updated or altered, whereas the children components should pass on data from State using Props. When we run this on the browser, we would be able to see that the default Props constructor values are rendered on the browser. Validation on the properties is a useful technique to ensure the proper usage of components. It will also help reduce the number of bugs that we might get very late after crossing the development phases. Doing so, it makes your code pretty readable. In this section, let us learn something about the React Component APIs. There are mainly three methods that we would want to discuss about -> setState(), forceUpdate() and ReactDOM.findDOMNode(). The setState() method will be used to update the state of the component. It will not replace the state of the component but only adds the changes to the original state. The forceUpdate() method updates the component manually and this API helps in achieving just that. The ReactDOM.findDOMNode() method is used for the DOM Node manipulations. For this to happen, we first need to import react-dom module. 1. componentWillMount is the method call, that gets called before rendering, on the client side and the server side alike. 3. componentWillReceiveProps is the method call, that gets called along with props update and also before any other render request is received. 4. shouldComponentUpdate is a boolean method call that returns either false or true. In turn, it determines whether or not the component gets updated. This is set to true by default. If there is no necessity for the component to render with an update of either the state or props, then this can be returned as false always. 5. component will update is the method call, which gets called before rendering the component. 6. componentDidUpdate is the method call, which gets called after rendering the component. 7. componentWillUnmount is the method call, which gets called just after the component is unmounted from the DOM. Event handling is the topic that we would be discussing here. On the component examples that we have seen till now, let us try and add some onClick events to show the power of React JS Events. When you want to update the state of the Parent component from one of its child components, we can then make use of the event handler (updateState) on the Parent component and pass it as a property to the child component. React Keys are useful when you are going to work closer with dynamically created components or when your lists are being altered by other users. Keeping the key value unique will enable you to keep your components identified uniquely. Now, with this understanding of keys, let us now go through what Routers are in React JS. Routers lets you route around your application via the links that we create to various components of the application. Let us now go through the step by step process of installation and a sample example to understand this. Installing the React JS Router component is as easy as running the following npm command, just the way we followed during the React JS environment setup. Once the application is run, we will be able to see the links alone on the browser and when we choose to click on any of the links showcased (then you can see that the route has been changed). As discussed earlier, Flux is a programming concept and a design pattern that talks about data being unidirectional. It means to say that the data that enters the application flows through it in one direction until it is rendered on the screen. 1. Actions − are sent to a dispatcher that will in turn trigger the required data flow. 2. Store - Stores are the places where the application state and logic are held. Each and every store maintains a particular state and this will be updated once when it’s needed. 3. Dispatcher − can be understood as the Central Hub of the application. All the data is dispatched and sent to the stores. 4. View - The View is the element that receives the data from the stores and renders it on the application. Once the installation is concluded, we then have to create the files and folders that are required for our application - which would typically be our actions, reducers, and components. Once, when we run the application, this is how it gets rendered on the browser. Once this installation is successfully done, then you’ll need to add some files that are required for creating any animations using React JS. Let us now create the style.css file from the command line tool itself. < ReactCSSTransitionGroup transitionName = "example"
A Higher Order Component, abbreviated as HOC is a wrapper around a React component and provides additional data as input. To be very precise, it is also a function which takes a component as input and returns a totally different component which internally wraps the original component. Let’s understand this with an example and also check how this actually works. MyHigherOrderFunction is a HOF which is used to pass the data to MyComponent. The function that we have created, then takes MyComponent and strengthens it with the data “newlyProvidedData” - returns the modified component which will in turn be rendered on to the browser. In this section, we will go through the best practices that one can imbibe to write better code. These techniques will help you stay consistent during your application development phase. 1. Usage of state can be avoided to the maximum and a good practice is to centralize the state and pass down the tree as props. A container element can be set around the properties which will ensure that the state is held intact. One of the best ways to tackle states in React JS applications is to use Flux pattern. 2. Always define PropTypes as they will help you in tracking all the props in your application. This always forms a reference to the other developers working on the same project. 3. React JS recommends the usage of Single Responsibility Principle, meaning, that there should be a single component that handles the responsibility of a functionality. It is suggested to refactor code wherever necessary so as to ensure that there are no more than one functionality per component. 4. Earlier React JS versions provided support for reusable functionalities, which is no longer available - hence the usage of Higher Order Components (HOC) is suggested.